Lovely review Rita! This was one of the early books, I read many years ago by Regina that has made me a fan of hers. When I checked, it was published back in 2010, I can’t believe it has been 7 years already! I loved this book and I am so glad you did too! Personally, I am glad the book brought you into my world, Carole. I am a better person for it. Thanks for such a great post! Happy reading,Rita!! I am a military brat, Mary. I could imagine Wentworth’ s “Pride.” Thanks for being a loyal fan. I have not read this one. I did read Darcy’s POV in Jeffers ‘Darcy’s Passions’. I will add this one to my wish-list. I have always liked the Captain Wentworth character and felt badly for him. Insurmountable odds were against him… he had to feel it. The Elliot family disdain for his position in society and lack of wealth. Add to that, Lady Russell’s influence… a mother figure on an impressionable girl. Yeah, I want to read this one. Reading this one makes the ending of “The Prosecution of Mr. Darcy’s Cousin” make more sense, Jeanna. This was one of my first JAFF retellings and I loved it. Persuasion is my favorite of the stories so I was more than excited to get a Wentworth POV tale. I’ll need to re-read this one soon after your lovely review, Rita! LOL! Sophia. I need to reread it after Rita’s lovely review. I’m another one who’s read and loved this book. If I hadn’t done so already, your review would have me wanting to read it, Rita. The way Regina wove all the elements of the story together was wonderful; the prequel part, CFW’s POV of the events of Persuasion, and then the sequel part that forms the later chapters. I particularly enjoyed reading more about the Crofts, one of my favourite married couples (along with the Gardiners) from Jane Austen’s books. What I loved in writing this one, Anji, was the research that showed that Napoleon thought to escape to the French-based settlement of New Orleans in the U. S. It provided me a twist to Wentworth’s tale. I loved this book! I read it immediately after finishing Persuasion because I wanted more Wentworth. Great review, as always! Thanks for being a long-time supporter, Anna. Gosh, Rita. What can I say? I am sorry I did not know about the review until Joana Starnes’s comment came across my feed. In truth, I’ve been down with pleurisy for over a week, but your kind words went a long way to bringing me around. Many thanks! I have read many of Regina’s books. 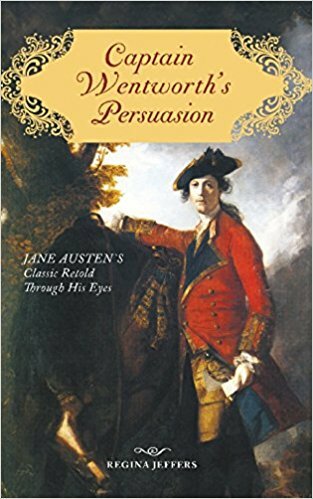 Plus Persuasion is my second favorite of Jane Austen’s books. I know I read this one as I have it in paperback so I now am reminding myself that there are early reads in paperback which I need to reread in order to post a review. Thank for the jog to my memory. I know I will like rereading this as from a man’s POV. I have felt badly when reading of Frederick’s flirting with Louisa and in the one movie version with Rupert Penry-Jones you do see him realizing that he has everyone thinking he will propose to her. But the letter he writes certainly redeems him in my eyes.